ASOCIACION DE VECINOS DE LA COLONIA LAS AMAPAS A.C.
Meeting was called to order at 10:25 am by Tom Swale, President of the Association who presented the ANA Board members Don Pickens Treasurer, Harris Spiridonidis Secretary, Gene Mendoza Board Member responsible for Police Relations, Javier Jimenez Board Member responsible for Streets and Infrastructure, Sylvia Toy Board Member responsible for Membership, and Robin Spencer Board Member responsible for Social and Special Events. The meeting was also attended by Viviana Teston, the full-time ANA Administrator. Additionally, he thanked Act II and Danny Mininni for providing the venue and the ANA volunteers for helping to organize the meeting. Tom Swale and Harris Spiridonidis were nominated by Gene Mendoza and seconded by Don Pickens to serve as President and Secretary of the Assembly respectively. The motion carried unanimously. Gardner Tonigan served as Vote Counters. Tom Swale convened the Assembly at 10:30 am. There were 127 members and proxies, not enough for a quorum. The first call was closed. Tom Swale made the second call and a quorum was established with 127 members and proxies, thus the General Assembly was declared legal. He mentioned that the minutes of the 2016 General Assembly had been posted on the ANA website and moved to approve, seconded by Gardner Tonigan. The 2016 General Assembly Minutes were approved by unanimous vote. Tom said that in 2016, ANA accomplished two major goals. First, we have almost completed the repaving of Hortensias. The work will be finalized after Eastern. More neighbors may be willing to contribute and we will reach out to them. This has been the most ambitious project ever carried out by a Neighborhood Association in Vallarta. Within less than a month, we managed to raise more than 200,000 pesos from individuals and whole buildings. After that, we had to convince the City to honor their commitments, working with Obras Publicas to provide us with workers and equipment. Then, we had to provide funds for supervision and contingencies. Despite the delays, we did get five well motivated but inadequately equipped workers. Thankfully, Fernando Hernandez took it as a personal challenge to get this work completed before Christmas and on budget. The lessons we learned are that it is necessary to work with City Hall although they can be unreliable and that everything takes longer and costs more than originally planned. Second, we have a new office. ANA has evolved to a much larger organization and having more than 300 members gives us more clout and ability to get things done. We are also blessed to have Viviana as a full-time administrator. She is in her best advocating for ANA at the City Hall. Therefore, we need an assistant to Viviana to man the day to day office operations. All that allows us to do more but also doubles our administrative costs. This leap of faith was rewarded by a pledge from Jim Gabbert to pay the office rent for one year. This is an investment to our future. Don Pickens, treasurer presented the Treasurer’s Report for 2016. He mentioned that ANA started 2016 with $124,976 pesos and ended the year with $193,787 pesos (some of that earmarked to finish Hortensias). The total income for 2016 was $1,178,504 pesos, of which $456,000 pesos was derived from contributions for Hortensias, Day of the Dead and for firefighters, $286,000 pesos from fundraisers, $90,000 pesos from individual memberships, $274,000 pesos from Full Building Memberships (FMBs), $66,000 pesos from donations and $6,000 pesos from business sponsors. Expenses for 2016 were $1,100,000 of which $442,000 pesos were spent for Administration, 240,000 for Meetings, Events and Fundraisers, 102,000 for Security (mainly for the Casita) 325,000 for Streets and Infrastructure (163,000 for Hortensias) The total budget was for $732,00 pesos. ANA reports to all members about income and expenses on a quarterly basis and Treasurer will post quarterly statements by category confidentially (password protected) on the ANA website. Members who desire to inspect the books and bank statements at the transaction level are invited to visit by appointment the Treasurer or Administrator. Don also asked for volunteers with accounting experience to help with the financial reports. Tom Swale reminded the members that nothing happens automatically and we always should prod the City to get things accomplished. Regarding Los Pinos, the landslide has undermined more than a meter of the pavement. We will need a retaining wall and for that neighbor contributions will be necessary from up to fifteen individuals living on that street as well as from members in Horizon, La Cima III, and Terrazas del Mar. Regarding the Highway 200 sidewalks, we now have an architectural detail of how to proceed. In the meantime, we are requesting that Obras Publicas has them cleaned from vegetation and fallen rocks. Regarding the Abedul stairs improvement, ANA can take the project to a certain point and then hand it to the City. We sponsored an architectural contest among students and selected the best design to present to the City. Regarding Plan Parcial 2.0, half has been submitted to the city and the rest is to be submitted in March, the goal being to tighten and improve Plan Parcial 1.0. We need the City’s continued good will and willingness to abide with their own rules. Regarding Security, the City is proceeding with a Neighborhood Watch Program, trying to prevent criminal activities. We are meeting with the Chief of Police and DA to learn about the details. They will provide a special vehicle with six Tourist Police officers dedicated to our area. Also, various business owners plan meetings with security experts to study vulnerabilities with the goal of placing security cameras. Regarding Social Events, it is worth mentioning the Annual Dinner/Dance, the Pulpito Drag Derby, the Day of the Dead block party, the monthly social gatherings and the upcoming Mariachis and Margaritas event with our neighbors to the North. Every month, Viviana sponsors a breakfast meeting with all FMB administrators to share information and solutions to problems. Regarding the Gardenias culvert inadequately draining rain water, we will work with the neighbors and City to replace with a better one. Other projects include repairing the Hortensias dip and improving street signs in the Business District. Don presented the proposed 2017 expense budget of $1,025,000 pesos. Proposed expenses include $557,000 pesos for ANA Administration (115,000 increase for Assistant and office equipment), 143,000 for Responsible Development (30,000 increase for Plan Parcial 2.0), 65,000 for Events, 15,000 for Security, 169,000 for Streets and Infrastructure, and 76,000 for contingencies. The projected income for 2017 includes $90,000 pesos from 60 individual members, $351,000 from 270 full building members, and $15,00 pesos from 10 business sponsors, thus resulting in $456,000 pesos projected membership income. He also expects $129,500 pesos in donations, 245,000 from fundraisers plus $194,000 pesos from the 2016 carryover. Tom asked for further comments or proposals for change of the 2017 budget. A member asked about the amount raised for the Hortensias project and Tom said it was approximately $260,000 pesos, with approximately 201,000 already spent and the rest earmarked for completing the project this year. 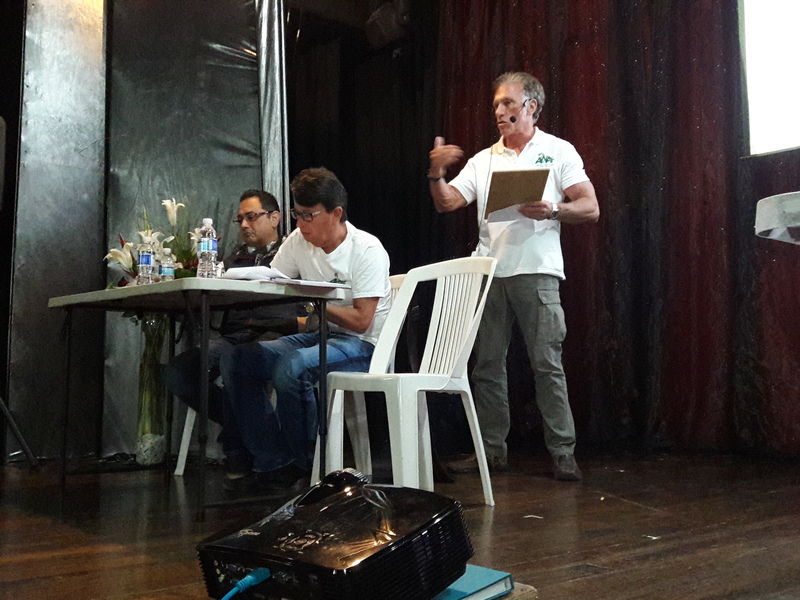 Another question referred to collaboration with the Vallarta Garden Club and Tom answered that although we have already approached them, nothing came through. Regarding the recycling program, Tom said that it continues but we are losing money. Myrna Brown made the motion to approve, seconded by Kathy Weber. The budget was approved by unanimous vote. Gardner Tonigan moved to appoint Viviana Teston as ANA Manager and was seconded by Sharon Dunn. The motion was unanimously approved. The final item on the agenda was choosing a date for the 2018 Annual Meeting and Tom proposed to hold it on Friday February 16, 2018. Carl Timothy moved to approve and was seconded by Pat Kelly. The motion passed unanimously. There being no new business, it was voted by acclamation that ANA have Tom Swale and Harris Spiridonidis notarize and file the Ordinary Meeting minutes of 2017 before the Notary. The Ordinary Meeting was adjourned at 12:05 pm.